Completely portable. Intended to be stored away when not in use. Battery powered. No wiring or trenching. Batteries (AA alkaline, included) will last the entire season in normal use with no charging. Wireless RF full function remote control included. Easy setup at the game. Unit slips on and off a common 1-1/2" pipe. Super bright high contrast displays are easily viewable by spectators. High impact water and dust resistant case. Scoreboard is designed to take a rain shower during the game. User serviceable. All components plug in and out. Proudly made and supported in the USA. 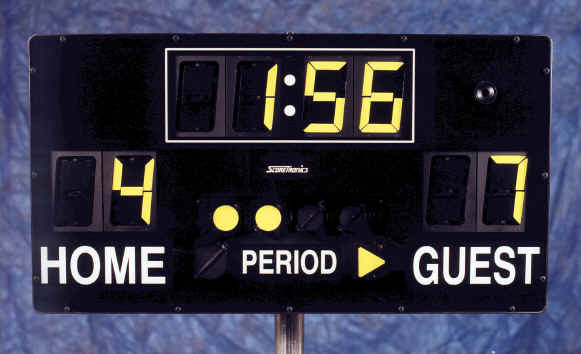 Displays: Four-digit clock, two two-digit scores, period (4 periods), and possession/penalty indicator. Horn: 108 decibels. Automatic at end of period or remote triggered. Affordable! $1495 including the remote control. Options: Click here for options details and pricing. Soccer model (clock counts up, no horn). ScoreTronics scoreboards are proudly made in the USA.